Todd is a man of great aspirations. He is a member of the Parkland Pops, and recently joined the Prompting Theater where he hopes to achieve his goal of being an actor. He wants to be able to show everyone what a good actor he is, and hopes to be famous one day! Although he has only been participating in the Prompting Theater for a few weeks so far, he is learning great acting techniques as well as learning what needs to be done behind the scenes. They are currently working on putting together a music video, which Todd is very happy about. He is also looking forward to acting in the Nutcracker movie they will be making later in the year. When he is not busy with acting and singing, he enjoys cooking things like beef tacos, pizza, and cheeseburgers and knows some of the ingredients needed to make each recipe. He also enjoys working at DSC as a materials handler, though his ideal job would be stocking the soft drinks in the fridge at the Dollar Tree, his favorite place to shop, and buy a drink. 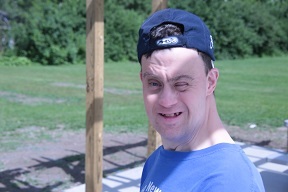 At his home in one of DSC’s residential group homes, Todd enjoys listening to Johnny Cash and watching NASCAR on TV. His favorite driver is #48 Jimmie Johnson. He has a racing game at home that he and a housemate often play together. Todd also expressed an interest in going out with some friends to see the X-Men movie and, of course, eat some popcorn. Sounds like it will be a fun time!